Controversial Joint List MK claims Israel's compensation plan for Turkish terrorists 'vindicates' her, demands apology from critics. 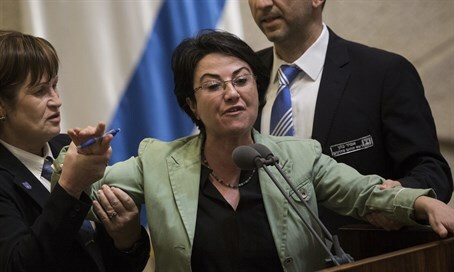 A shouting match erupted on the floor of the Knesset on Wednesday during an address by Joint List MK Hanin Zoabi following the government’s ratification of a reconciliation deal with Turkey. Zoabi, who is known for her outspoken opposition to Zionism and support for pro-Hamas activities, participated in the 2010 “Gaza flotilla” which attempted to break Israel’s security blockade on the Hamas regime in the Gaza Strip. Onboard the Turkish vessel Mavi Marmara as it attempted to run the blockade, Zoabi was briefly arrested. The Mavi Marmara incident, during which 10 pro-Hamas Turkish terrorists were killed while attacking Israeli soldiers, was a catalyst for the diplomatic rupture between Ankara and Jerusalem, leading to six years of tensions between the former allies. On Wednesday Zoabi gloated over Israel’s concessions to Turkey, including a $20 million compensation package for the families of the Turkish terrorists killed onboard the Mavi Marmara. Blasting Israeli “incitement”, Zoabi claimed the newly-inked agreement with Turkey vindicated her support for the flotilla and demanded an apology from her critics. “I stood here six years ago. Remember the incitement, the hate, and all the noise? And what have we come to since then? To an apology and compensation for the families of those who were labelled ‘terrorists’”. Zoabi’s comments provoked a sharp reaction, with MKs loudly rebuking the Joint List MK.